Mark Buford began cartooning at the age of 10, during his tenure in the public school system. As much of his work took place during class, early recognition came in the form of corporal punishment. Mark went on to earn a degree in psychology from the University of West Georgia. Upon graduation, he continued to draw comics and eventually went back to school to learn graphic design. As a freelance graphic designer, he found some success in submitting his comics to magazines and alternative newspapers. A major syndicate executive contacted Mark after seeing one of his cartoons in a local Atlanta newspaper. He encouraged Mark to keep writing and drawing, and to submit any strip ideas that happened to come up. From 1995 to 1997, Mark worked on developing comic strips, finally landing his first syndication deal in 1997 for a daily strip titled Meatloaf Night. 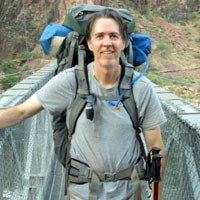 Mark continued to freelance, selling gag panels to magazines and alternative newspapers until early 2006, at which time he began developing Scary Gary. He submitted Gary in December of 2006, and teamed up with Creators Syndicate in February 2007. Scary Gary made its debut in June 2008. Mark lives and works in Atlanta, Georgia.